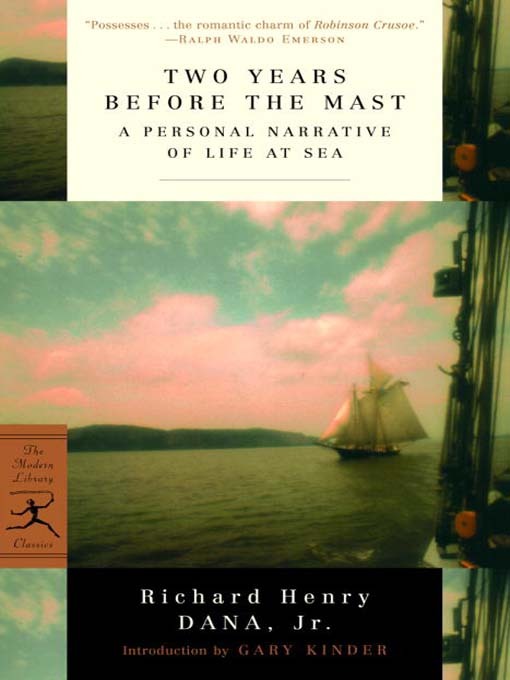 by Richard Henry Dana, Jr.
Tracing an awe-inspiring oceanic route from Boston, around Cape Horn, to the California coast, Two Years Before the Mast is both a riveting story of adventure and the most eloquent, insightful account we have of life at sea in the early nineteenth century. Richard Henry Dana is only nineteen when he abandons the patrician world of Boston and Harvard for an arduous voyage among real sailors, amid genuine danger. The result is an astonishing read, replete with vivid descriptions of storms, whales, and the ship's mad captain, terrible hardship and magical beauty, and fascinating historical detail, including an intriguing portrait of California before the gold rush. As D. H. Lawrence proclaimed, "Dana's small book is a very great book." Gary Kinder - Author of introduction, etc.